Independent directors are those directors who, aside from sitting on a company’s board of directors and getting paid for doing so, have no material interest in and hold no position at the company. Be sure to look at all three pages of visualizations: we provide not only median and highest independent director pay for each available year since 2006, but also show change over time (page 2), and provide individual independent director pay and other information (page 3). On this page, companies can be ranked in terms of either median or highest indpendent director compensation, and data on an individual company is displayed when you select that company. Scroll over a bar to get the relevant number rounded to the nearest $1,000. In 2012, Google had the highest median independent director pay ($418,856) as well the highest independent director pay ($1,177,384). 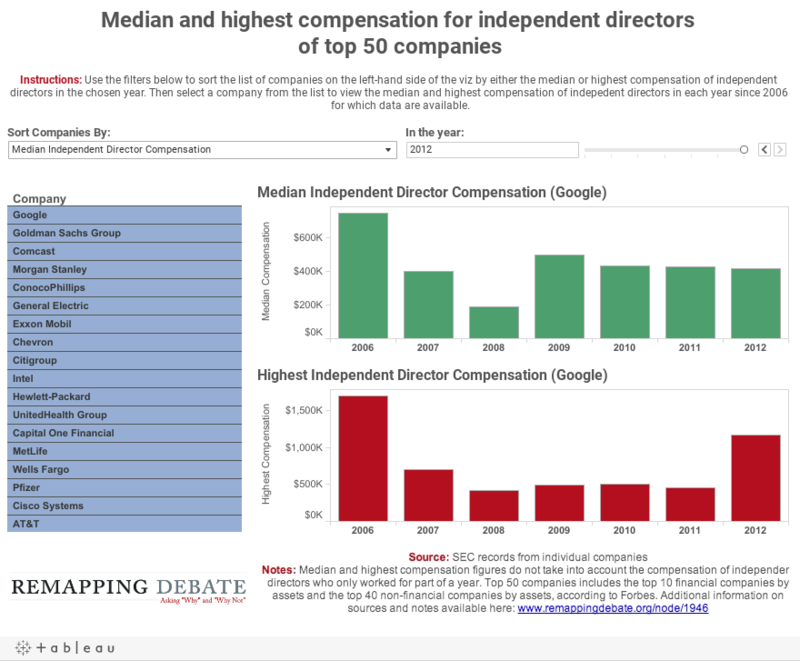 The median independent director pay was at least $200,000 at 46 of the top 50 companies. The highest independent director pay was at least $400,000 at 12 of the top 50. Note: the vertical scale (in thousands of dollars) changes for each company selected. Thus, one can visually assess change over time and pay for a single company by studying the chart, but one should not make an assessment between and among companies by comparing the size of the data bars. Click here for important additional notes.